Our Toddler Program accepts 15 children 18 months (1 ½) - 30 months (2 ½) years of age. Half day programs include morning snack and hot lunch. The Toddler program is an introduction to the Montessori method of education. The program is carefully designed to provide an environment furnished with materials and activities scaled to the child’s size and abilities furnished with tactile apparatus for developing fine motor skills. Toddlers engage in play and learning activities which are fun and educational focusing on the child’s individual stage of development and readiness while benefitting from small class sizes with a low teacher: student ratio. Outdoor play provides the toddler with opportunities to develop gross motor skills, social interaction and fresh air. Circle activities include themes, songs and movement giving the toddler a valuable opportunity to develop socialization skills and speaking skills. 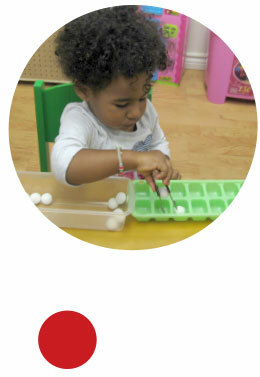 In keeping with Montessori philosophy, all activities aim to assist the toddler in acquiring independence.